The US investigation into steel imports is not particularly novel. The US steel industry is highly organized for such purposes. The steel sector has the significant global excess capacity, which makes for intense competition. What is relatively new about the investigation is that it is being conducted under Section 232 of the 1962 Trade Expansion Act, claiming that the steel imports are a threat to national security. It has only been used 14 times in its 55-year history. It has not been used since 2001 when George W Bush launched a year-long investigation into iron ore and steel, and ultimately took no action under Section 232. When the announcement of the investigation was made, the President was not surrounded by generals, but by industry CEOs. The threat to national security seems a stretch. The Pentagon has not sought to restrain imports, and its steel needs are met by domestic producers. 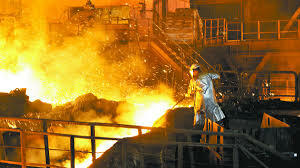 The US is the fourth largest crude steel producer in the world behind China, Japan, and India. It produced nearly 80 mln metric tons in 2015, down from 88 mln tons in 2014. In the first 12 weeks of the year, the US produced an average of about 1.75 metric tons a week, roughly a 5.3% gain from the same year ago period. It was utilizing about 73.3% of its capacity. The Department of Labor estimates that the steel industry directly employs about 145k workers in the United States. At it peak in 1953, 650k workers were directly employed by the steel industry. What happened to 80% of the jobs in the steel industry? According to the industry association, labor productivity has increased five-fold since the early 1980s. Then it took a little more than 10 hours to produce a finished ton of steel. By 2014, this had fallen to 1.9 hours. Now that is productivity. Unfair trade practices may not have helped, but the real culprit, as in so many industries, is technology. US steel companies have moved away from the making steel by reducing metallic iron from ore and making pig iron and steel. It is less interested in extraction of raw materials and more interested in recycling. Mini-mills or specialty steel mills essentially recycle scrap steel and account for nearly two-thirds of US steel production. In addition to citing national security, the other way the Commerce Department's investigation may differ from other such investigations is the time it will take. The law allows for a 270-day period. Last week President Trump said the investigation would take 50 days. Don't be surprised if the US President learns that steel, like health care and Chinese relations, are more complicated than he thought. What caught some investors and observers off guard was that it seemed that the Trump Administration would be favoring consumers over producers. His Administration had granted the Keystone pipeline an exemption from having to use American made steel. The rhetoric about boosting auto production in the US would seem to favor cheap steel. The auto industry accounts for a quarter of US steel consumption. Tariffs are often the result of the Commerce Department investigation. That raises the price of imports, and domestic producers often will raise their prices too (because they can). Higher cost steel can boost the sales price of vehicles as the cost is passed on to the buyer. This is one of the problems of such unilateral action. Multilateral recourse, available through the World Trade Organization could address the underlying action: dumping or selling the steel below the cost of production. How many time must we learn that an eye-for-an-eye and a tooth-for-a-tooth kind of justice results in a village of blind, toothless people? Despite assertions that multilateral institutions have been hijacked and no longer serve their initial sponsor's (the US) interest, the US has won about 85% of the case it has brought to the WTO. When the President signed the Executive Order regarding the steel investigation, he played down the role of China. However, Commerce Secretary Ross seemed to emphasize China, which accounts for around 2% of US steel imports. Partly due to the trade policy, which also included tariffs on some steel products, US imports of Chinese steel have fallen by half over the past two years. Steel, not pharmaceutical or autos, seems to be the first industry that the Trump Administration will investigate. The populist-nationalist wave was turned back in the third eurozone member (Austria, Netherlands, and now France). The AfD in Germany appears to be imploding. However, last week's IMF meeting, like the G20 meeting, could not hammer out language on a trade that was acceptable to the new US Administration. The call to avoid protectionism, and even a compromise, like a reference to fair trade was not included in the IMF statement. Still, the anti-dumping action is not the same species as protectionism. However, the claim that national security interests are at stake seems to be overplaying that hand. An investigation in a fifth of the time that is allowed may seem like the conclusion is already known.